When it comes to spending quality time with your four-legged friend, there are endless opportunities in Monterey County. Here are some pet-friendly recommendations that will make your pet extra happy and healthy. Start off in Marina, at the pet-friendly Sanctuary Beach Resort and venture over to Locke-Paddon Wetland Community Park where you and your leashed-bestie can enjoy a relaxing stroll along the nature trail. Continue south to Seaside/Del Rey Oaks to the Frog Pond Wetland Preserve, another destination of relaxation for both of you. If you want to pick up the pace a little more and venture out on rougher terrain, make a stop off Highway 68 and test out Toro Park, and then Fort Ord National Monument. Nestled in the hills east of the highway is Jacks Peak County Park - a local dog&apos;s favorite for mild wilderness adventure and retreat...not to mention one of the best places to get a panoramic view of the Monterey Bay and Pacific Ocean! On the other side of the hill along Carmel Valley Road is an expansive haven of fun, Garland Ranch Regional Park. Once you arrive in Monterey, unleash your pooch at the El Estero Park where canines get a chance to socialize and meet new friends. Across the way towards the bay, Monterey State Beach sets the stage for a fun mile-long walk from Old Fisherman&apos;s Wharf. If you and your dog want to endure more than flat, sandy beaches, head up to Veteran&apos;s Memorial Park where a steep incline is sure to keep you and your canine in tip-top shape. As you round the corner along Ocean View Boulevard in Pacific Grove, you come across the Asilomar State Beach - a paradise for surfers and their fury friends. Continue south to Carmel and enjoy an al fresco lunch at the Forge in the Forest- equipped with a menu specifically for the canine&apos;s discerning palate. Down near Big Sur, Garrapata State Beach boasts as another wonderful spot for leashed dogs to enjoy the coastal air and vegetation. But the mother of all beaches for your pet is Carmel Beach- where everyone is allowed off-leash to run and frolic in the waves! 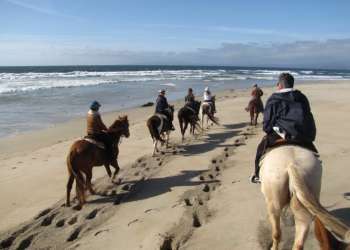 Also visit our list of "Pet Friendly" hotels, restaurants and attractions, animal hospital and doggie day care in Monterey County.